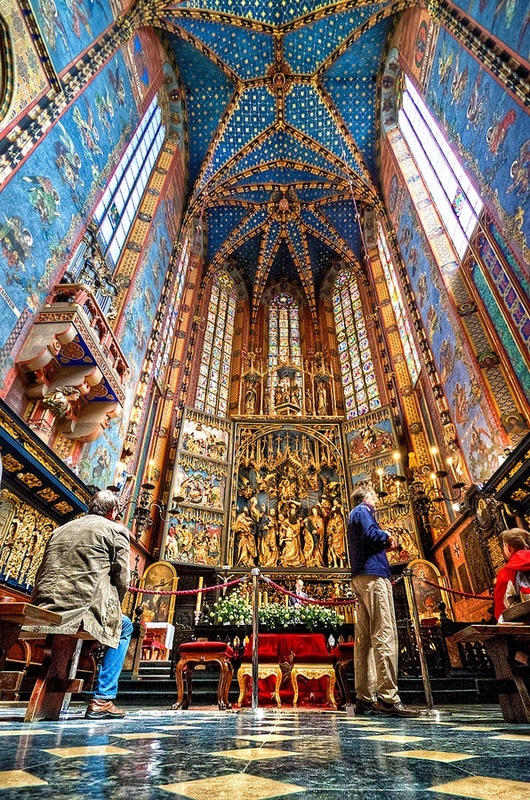 The Altarpiece of Veit Stoss, also St. Mary's Altar (Ołtarz Mariacki), is the largest Gothic altarpiece in the World and a national treasure of Poland. It is located behind the Communion table (mensa) of St. Mary's Basilica, Kraków. The altarpiece was carved between 1477 and 1489 by the Bavarian sculptor Veit Stoss (Wit Stwosz) who moved to the city at around that time and lived there for the next 20 years. It was funded by the citizens of Kraków at the cost of over two thousand gulden. In 1941, during German occupation, the dismantled Altar was shipped to the Third Reich on the order of Hans Frank – the Governor-General of that part of occupied Poland. It was recovered in 1946 in Bavaria, hidden in the basement of the heavily bombed Nuremberg Castle. The High Altar underwent major restoration work in Poland and was put back in its place at the Basilica 10 years later.